As an undergraduate studying art history in the late ’60s, I lusted after a Thonet rocker, which I pronounced “thon-it,” and a hanging Tiffany lamp. I imagined them in a book-lined room with a cat curled up on the rocker. 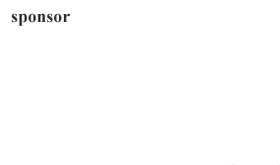 But, as a student, I couldn’t afford even reproductions. At that time, work by Louis Comfort Tiffany (1848-1933) was enjoying a renaissance of interest after years of languishing in attics or museum storerooms. As a canny marketer, Tiffany had donated pieces to museums, which were happy to have works that had won medals in international exhibitions including 44 at the1893 World Columbian Exposition, Chicago, and the Bronze Medal at the Exposition Universelle in Paris in 1900 for the Dragonfly Lamp. The son of Charles Tiffany, the renowned jeweler and founder of Tiffany and Company in 1837, the younger Tiffany was expected to join the family business, but his ambition was to become a painter. (He did become the firm’s first design director in 1902.) In the 1860s, Tiffany studied with a number of the leading painters of the day, including George Inness, Samuel Colman, Léon-Adolphe-August Belly, and at the National Academy of Design in New York City. Tiffany was presumed to be the designer of all works coming out of the successive iterations of his studio. In reality, he employed a number of designers, including Clara Driscoll (1861-1944) 2, Agnes Northrop (1857-1953), and Frederick Wilson (1858-1932). Arthur J. Nash (1849-1934) formulated the unique glasses that distinguished Tiffany’s work. 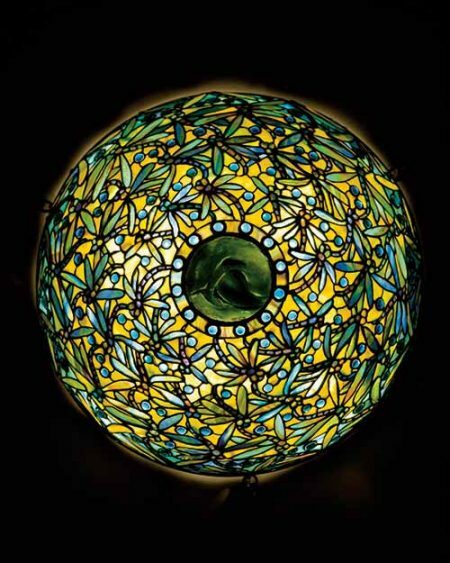 The exhibition “Tiffany Glass: Painting with Color and Light” features 20 lamps and five leaded-glass windows as well as 100 examples of glass and glass “jewels” and the tools of the artisans who executed the Art Nouveau Tiffany designs. 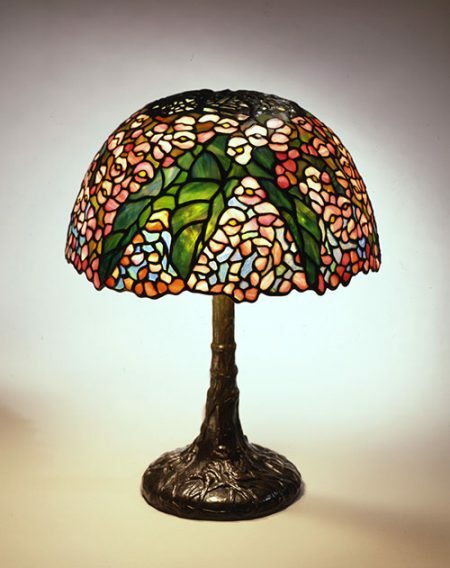 (He was the primary proponent of this style in the U.S.) The work came from The Neustadt Collection of Tiffany Glass, Queens, NY, which holds more than a quarter of a million pieces. The first Tiffany acquisition by Dr. Egon Neustadt (1898-1984) and his wife, Hildegard (1911-1961), was a lamp found in a Greenwich Village second-hand shop in 1935. The title of this exhibition is particularly apt. Writing about the Studio Glass Movement, I frequently compared sculptural works by artists like Dominick Labino and Harvey Littleton who “suspended” veils of colored glass in clear glass to color field painters such as Morris Louis, Kenneth Noland, and Helen Frankenthaler. I found glass to be a better medium to express the true nature of color–light. Well by Fence Window, circa 1910, attributed to Northrop, offers a perfect example of how colored glass enlivens painting. The informative label identifies the various types of glass used to create painterly effects: streaky glass (two or more colors of molten glass fused together) for the sunset’s fading light, the palm tree’s rough bark, and the wood grain of the well and fence; spotted glass for the dappled sunlight and shadow on the path, the hills, the trees, and shrubs; rippled glass (textured with surface waves) for the stream’s gentle flow. For the light playing on the top of the fence post, yellow glass sheet was fused to blue glass and then acid-etched to reveal the blue. This was then plated behind a brown-and-white streaky glass for the sunlit effect. 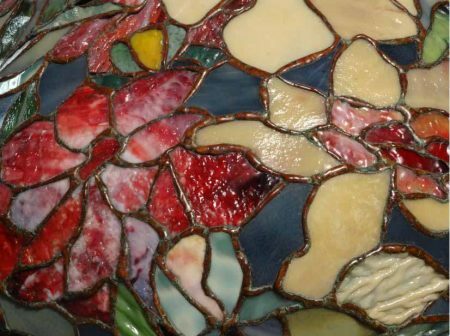 Tiffany dominated the stained-glass market at the turn of the last century, but since windows are site specific, they are not as well known as the lamps. Produced in multiples, retailers and designers could mix and match bases and shades and make specific requests. In 1906 when the average income was $575, the price for a lamp was $400 or $9,800 in today’s dollars. 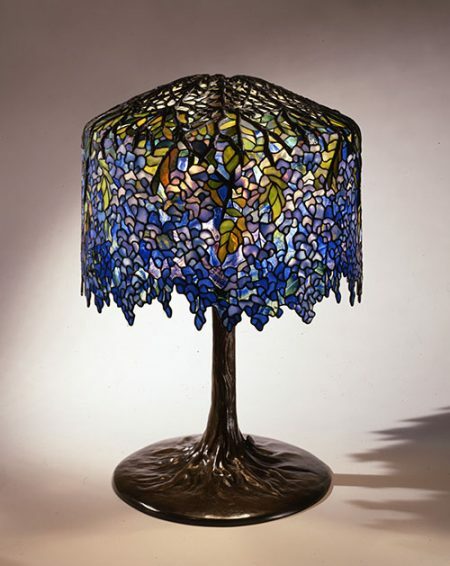 The best-selling lamp in the Tiffany line was the Wisteria Library Lamp. It was designed by Driscoll, whose Dragon Fly Lamp snagged the Bronze Medal at the Exposition Universelle. It required 2,000 pieces of glass, each carefully chosen to convey the impression of a tree in full bloom. The irregular edge of the shade echoes how blossoms cascade from the tree’s boughs. The bronze base approximates the trunk’s roots stretching out along the ground. Although most of Tiffany’s output was “mass produced” by an assembly line of specialized workers, there were some commissions, such as the Dragonfly Hanging Shade, c. 1905. A swarm of dragonflies encircles the shade, and the surface is activated through the use of translucent turquoise “jewels” that capture and reflect light. With the rising popularity of Tiffany’s work in 1960s, forgeries began to appear. The exhibition includes three fake lamps, and visitors are challenged to identify them. Some of the telltale signs are a garish palette, confusing patterns, and clumsy soldering. If the exhibition whets your appetite for more Tiffany, there are four ecclesiastical windows in CAM’s gallery 214; a Pond Lily Standing Lamp in gallery 216; and in gallery 224, 25 examples of opalescent Favrile glass, a term invented by Tiffany for “handmade.” There is also the St. Michael Window in Trinity Episcopal Church, Covington, dedicated to the memory of Howell Lewis Lovell and Howard Lewis Lovell, Jr., in 1902. The decorative arts are sometimes called “minor arts.” Regardless of the nomenclature, Tiffany made a major contribution to the Art Nouveau aesthetic in the U.S.
1 Although Tiffany’s company is best known as Tiffany Studios, it operated under a succession of names in addition to Louis Comfort Tiffany and Associated Artists. They are Louis C. Tiffany & Company (1878-85); Tiffany Glass Company (1885-92); Tiffany Glass and Decorating Company (1892-1900); Allied Arts (1900-1902); and Tiffany Studios (1902-32). He also owned the Stourbridge Glass Company (1893-1902), Tiffany Furnaces, Inc. (1902-19); and Louis C. Tiffany Furnaces, Inc. (1920-28). 2 Clara Pierce Wolcott Driscoll (1861-1944) was born in Talmadge, OH, and trained at the Western Reserve School of Design for Women (later the Cleveland Institute of Art) and at the Metropolitan Museum Art School. She was hired by Tiffany in 1888 and worked in his studio until 1889 when she married Francis Driscoll. Women who were engaged or married were not allowed to work. Driscoll returned after her husband’s death in 1892 but left again in 1896 when she became affianced to Edwin Waldo, who oddly disappeared on a trip to meet her family in Ohio, surfacing five years later with no explanation. In 1897, Driscoll again returned to Tiffany and worked until 1909 when she married Edward A. Booth, a marriage that lasted 35 years. Driscoll was included in the April 17, 1904, New York Daily News article “Women Who Make $10,000 a Year or More.” She inspired two novels: Susan Vreeland’s Clara and Mr. Tiffany (an enjoyable read if not strictly historically accurate), 2011, and Echo Heron’s, Noon at Tiffany, 2012 (Driscoll supposedly designed her first lamp, the Daffodil Lamp, during her lunch hour). 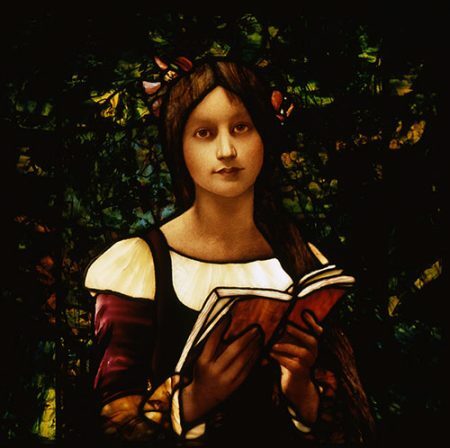 3 In the 1960s, the Lithuanian-born American artist Albinas Elksus (1926-2007) revived the medieval tradition of painting on glass, the very tradition that Tiffany had rejected. For stained-glass artists this venerable technique looked new, and Elskus became a popular teacher and proselytizer for it.